Your Premier Napa Valley Merus lot is powerful, graceful, balanced and epitomizes the Coombsville appellation. The cooler climate allows for a long, slow, ripening period and more hang time, which creates wines that are intensely concentrated but also soft and subtle. The wine is aged in 100 percent French oak. Aromas of black currant and berry syrup carry through onto the silk and rich palate. Merus earned its cult status through hard work, uncompromising standards and incredible fruit from the Coombsville AVA in southeastern Napa Valley. For Winemaker, John Clews, his hands-on approach to winemaking and strict farming protocols create wines that are handmade in every sense of the word. A Rhodesia native, John brings over 25 years of experience in the wine industry and continues Merus' commitment to producing world-class, handcrafted cult Cabernets. John started his career as a London accountant, but his passion for wine led him to swap his note pad for a crush pad and life as a full-time winemaker. Having received his degree at University of Cape Town, John discovered his passion for wine and quickly became enthralled with the art of winemaking. In pursuit of his dream, he attended the University of California, Davis where he was awarded the prestigious M.A. Amerine Research Scholarship from the Wine Spectator and earned his M.S. in Viticulture and Enology. While he attended Davis, he worked almost full time for the best wine shop in Sacramento, Corti Bros, where he thought he learned as much as he did at Davis. After graduation John went on to work at Preston, Dry Creek for a harvest, then at Newton as the cellar master. John refined his craft working with varied appellations and varietals before achieving a position as winemaker at Konocti in Lake County. 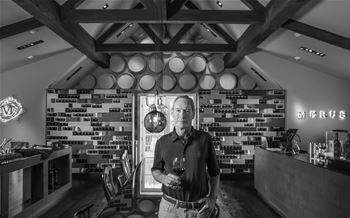 He has since worked at Steele Winery in Lake County as General Manager/ Chief Enologist, Clos Du Val in Napa as Head Winemaker/Chief Operations Officer and most recently, E & J Gallo as Red Wine Manager. John believes the climate, soils and varietal intensity make Napa Valley a special place to produce wine. The Merus boutique winery is gorgeous and the Coombsville and Yountville vineyards are about as good as you can get on the valley floor. John looks forward to continuing Merus' hallmarks of producing rich, opulent and silky Cabernets. His typical day at Merus begins with meeting with the cellar crew and vineyard managers, working in the wine caves and cellar, and, when time allows, interacting with guests in the Merus tasting room. In his free time John enjoys staying active in the outdoors by hiking, cycling and playing tennis in addition to reading and listening to classical music. His favorite place to travel is Europe because of the varied cultures, food and wine. John lives in Napa with his wife, Lisa, and three cats, Bruiser, Zam Zam and Tempest.